Brew delicious, organic kombucha at home and save money! Commercial kombucha sells for $3+ per bottle. 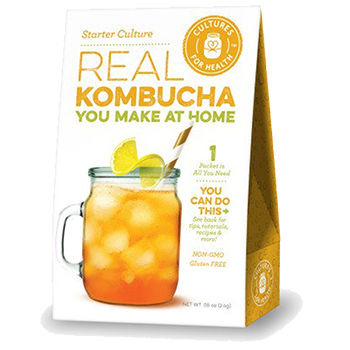 Using our kombucha starter culture you can brew your own kombucha for $2 per gallon. When combined with sweetened tea and fermented, the resulting kombucha beverage has a tart zing that can be flavored in a variety of ways! Each box contains 1 dehydrated kombucha starter culture (SCOBY) and 25 pH strips. Cultures at 68° - 85°F. Initial batch must culture for 30 days. Subsequent batches culture in 7-30 days. This starter requires white cane sugar, plain black tea, and distilled white vinegar for culturing. Reusable culture - transfer the culture (SCOBY) from batch to batch. With proper care, the culture can be used indefinitely to create delicious, fermented tea! Instructions for using this culture are included. Organic sugar, organic black tea, live active cultures. Our Kombucha Starter Culture is shipped in a dehydrated state and must be rehydrated before use. For best results, store in the refrigerator and use by the date on the box.